"Life is a great and noble calling, not a mean and grovelling thing to be shuffled through as best we can, but a lofty and exalted destiny." 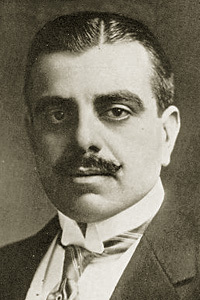 Forty-eighth Imam of the Shia Ismaili Muslims, Sultan Mahommed Shah, Aga Khan III was one of the founders and the first president of the All-India Muslim League, and served as President of the League of Nations from 1937-38. A keen racecourse enthusiast, he owned several Derby winners. Aga Khan was quite ill in the winter of 1951-1952 and was not away from his villa during the period in which he is claimed to have been initiated. Barring a report from the Swiss Grand Lodge Alpina to the contrary, it can be concluded that he was not made a freemason. Aga Khan III died 11 July at Villa Barakat, near Geneva, Switzerland. On the 14th his body was flown to Cairo, then flown to Aswan and then by barge across the Nile to the Begum's villa, Noor el Salaam where it was temporarily placed in the rotunda. A devotional service was held in Aswan's Abu-Shok mosque on the 15th, and the heavy oak coffin was carried to a vault for temporary entombment. Once the nearby stone mausoleum was completedover a year laterhe was reinterred with a short ceremony in mid-February 1959 before 500 invited attendees.3 Neither photographs nor reports mention a masonic funeral. This re-interment may be the source of the story that his funeral was masonic. 1. Lettres Mensuelles, quoting the Kansas Masonic Digest, stated that he was initiated in December, 1951, and was given Masonic burial services on July 30, 1957. Cited in 10,000 Famous Freemasons, William R Denslow. Missouri : 1957. 2. The Memoirs of Aga Khan. London : Cassell and Company Ltd, 1954. pp. 138-39. 3. Throne of Gold, The Lives of the Aga Khans, Anne Edwards. New York : William Morrow and Company, Inc, 1995. pp. 221-23.